Not Sure of your tyre size then just enter your car reg or call your local D&G Autocare Garage. We are only too happy too help. If you need same day fitting and it is not available on ordering facility phone 01383 623853 and if we don’t have them in stock, we will do our best to source them out for you. We guarantee to beat any tyre price both in branch and online. We stock a large range of tyres from budget to brand names. Not Sure or Don’t Know if your tyres need to be changed? 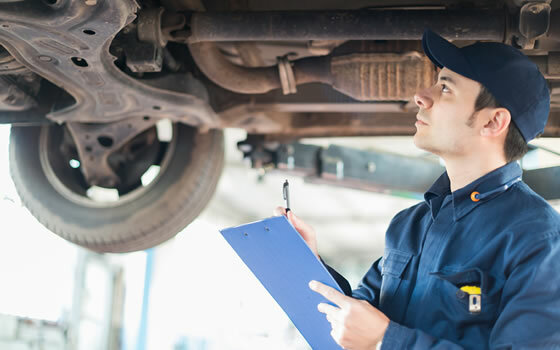 D&G autocare will give you accurate free advice and a tyre report on the condition of all your tyres. At D&G Autocare we guarantee to beat any tyre price both in branch and online. We stock a large range of tyres from budget to big brand names. Just complete the form below and our tyre technician will contact you with a great deal. 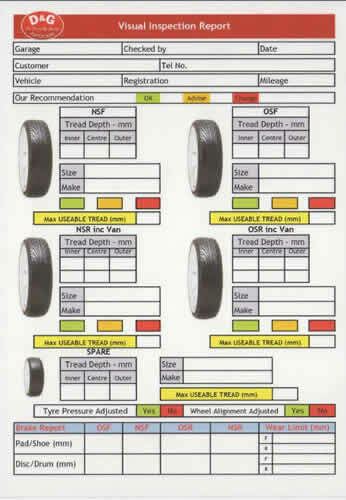 A tyre report will be supplied with every tyre check giving information on the condition of all your tyres. It is easy to check the tread depth of your tyres for yourself, without the need for a fancy depth gauge. Just a twenty pence piece is all you need! There’s a rim around the edge of the 20p coin that is about 2mm wide. 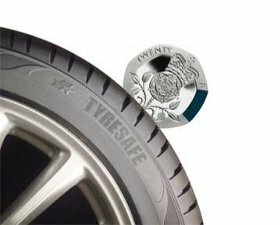 Stick the edge of the coin inside the tyre tread and if you can’t see the raised rim you’ve more than 2mm of tread. If you can see the raised rim then you may need to have tyres replaced. 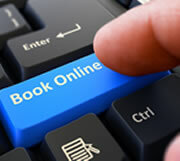 Please complete our Free Tyre Check form and confirmation of your tyre check booking will be emailed to you. You could face a £2500 fine and get 3 penalty points if your are caught driving with defective or illegal tyres. Check the tread depth of your tyres. although the minimum legal tread depth is 1 .6 mm, we recommend that tyres should be replaced when the tread depth reaches 3 mm. Remember as your tread depth decreases your stopping distance increases. This is even more significant for cars with large wheels and wider tyres. Don’t forget to check tread depth of your space tyre. £5 Off off one tyre, £10 off two tyres, £20 Off 4 tyres.